I have been interested in weather from a young age. 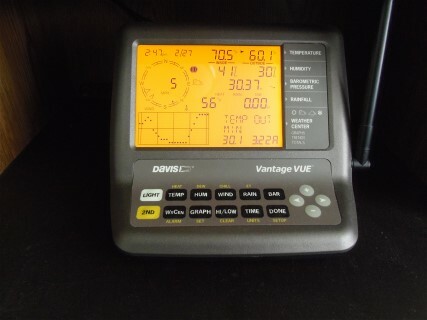 I got this Davis Vantage Vue weather station back in December of 2016. The outside unit is installed on a pipe 12 feet above ground in my backyard. The picture on my web page is of my actual Vantage Vue weather station. I updated it in January of 2017 with the data logger. I then started to send data to Weather Underground and then I got this page setup with a lot of help from a friend. It took me some time to understand how this web page works and how it gets the data from my weather station. I am also now a WXII channel12 weather watcher. My inside weather console picture below send 4 emails a day to the meteorologists before their scheduled weather broadcasts.